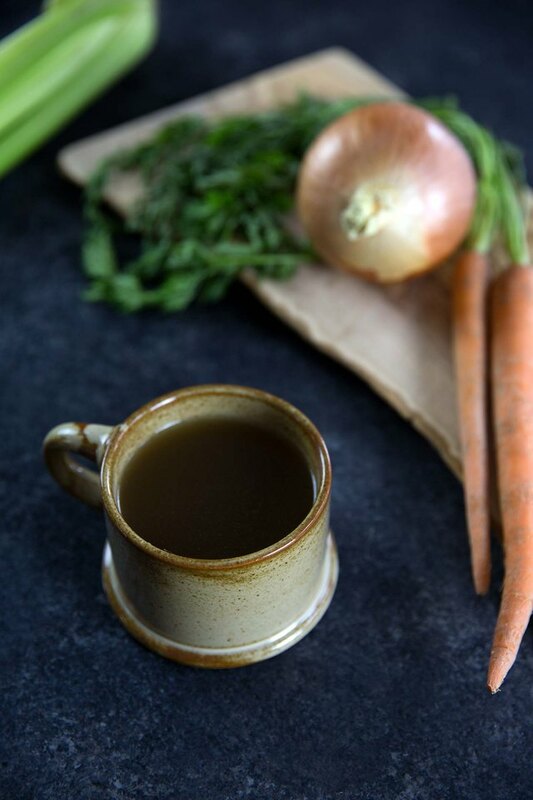 Bone broth is a healthy addition to any omnivorous diet, one that has gained tremendous popularity in recent years. It's rich in collagen and gelatin, heals the gut, and reduces inflammation. It first became popular when the Paleo diet went mainstream, and I was a bit confused by it at first. I've been making homemade stock from bones from years; was there really any difference or was this just a clever new name? It turns out, there's a slight difference. 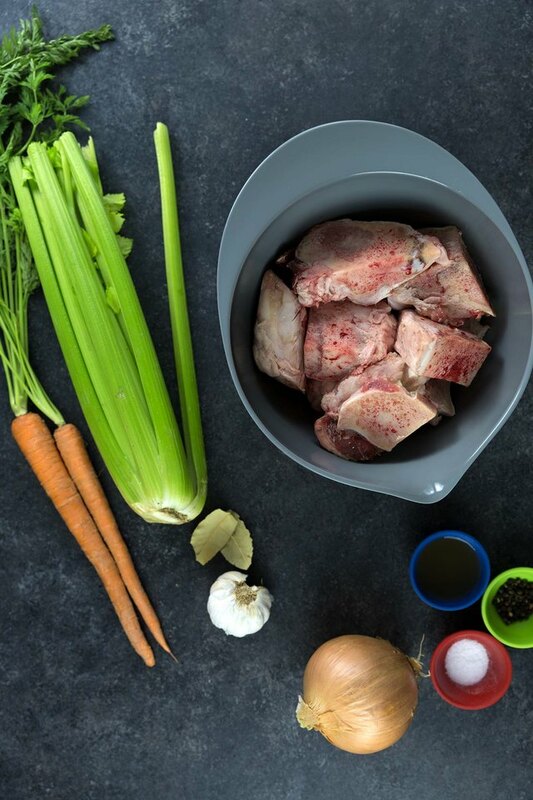 Bone broth is, well, a broth; it's for drinking, whereas stock is a base ingredient intended for soups, sauces and stews. While bones are the main ingredient for both, stock should have little to no seasoning. 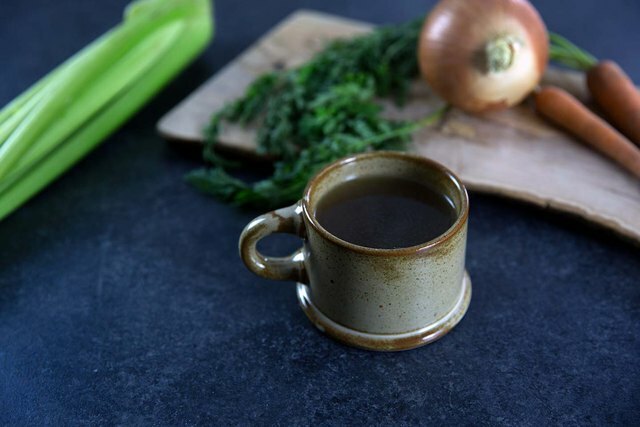 Bone broth adds salt and, more often than not, apple cider vinegar, giving it a pleasant flavor for drinking on its own. It can be prepared on the stovetop and in a pressure cooker, but the slow cooker is a fantastic "set it and forget it" method. When possible, it's best to use organic ingredients and antibiotic/hormone-free bones for this recipe. Ask your butcher. If you can't find them locally, try a website such as U.S. Wellness Meats. The quantities are a bit loose here; you can adjust for the size of your slow cooker, and go heavier on the bones for added collagen. Adding extra vegetables and/or aromatics will add flavor. 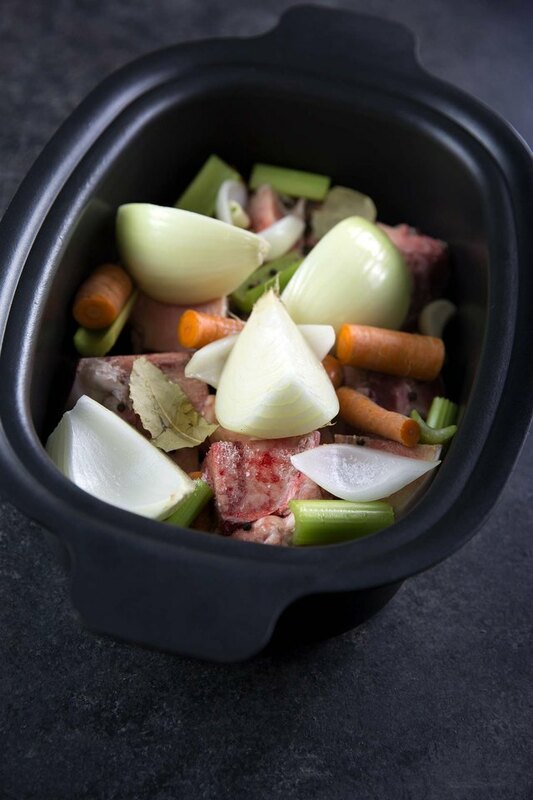 Step 2: Add ingredients to a slow cooker. Layer the bones in the bottom of the slow cooker, followed by the vegetables, salt, peppercorns, bay leaves, garlic, and apple cider vinegar. Step 3: Fill almost to the top with water. Fill the pot almost all the way to the to top with water (you can technically go all the way to the top, just be careful to avoid spills). Step 4: Cook on low for 8 to12 hours, then chill. Cover and cook on low for 8 to 12 hours. The longer the ingredients cook, the more flavorful the broth will be. 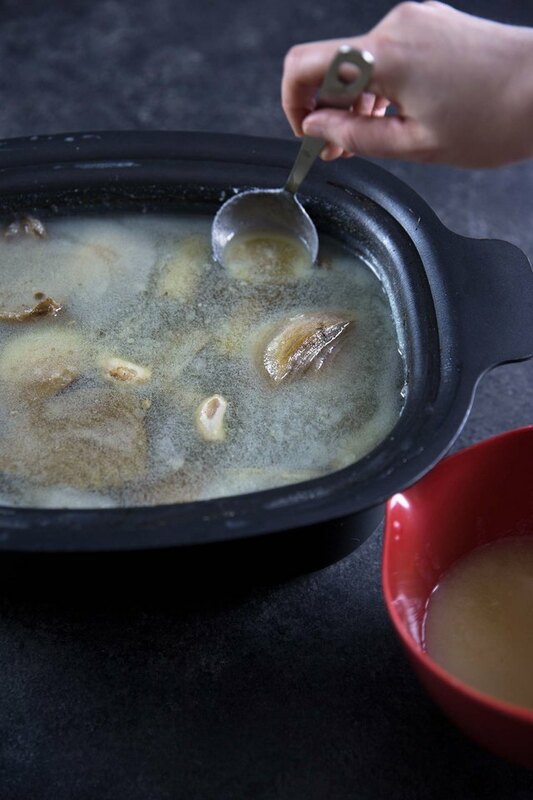 Allow to cool for 15 to 20 minutes, then chill to allow the fat to rise to the top. Step 5: Skim the fat and remove the solids. Use a ladle or large spoon to skim the fat from the top. It's fine if you can't get all of it in this step. Using tongs, remove the solids, then strain the liquid through a fine mesh strainer lined with cheesecloth (this will catch any remaining bits of fat and scum). Step 6: Heat and serve. 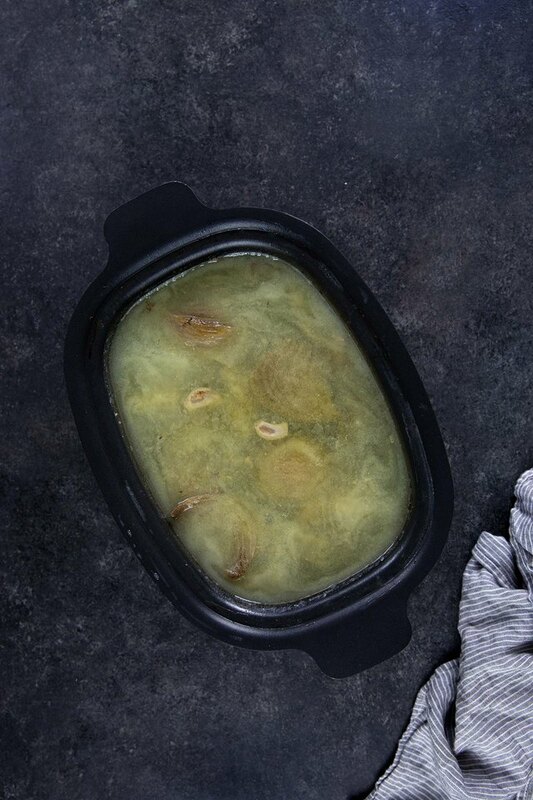 Heat and serve (either in the microwave or a small saucepan). 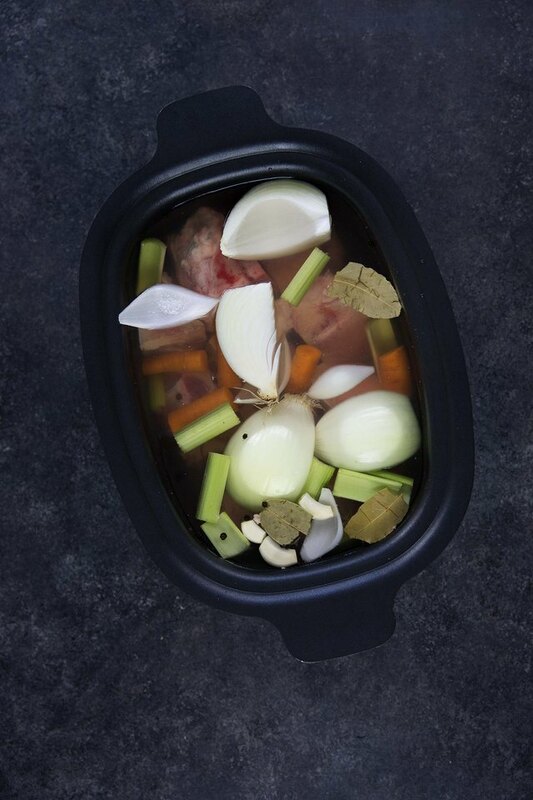 The bone broth will keep in the fridge for several days, or in the freezer for several months.